Alton is a community located in a premier luxury destination between Donald Ross and Hood Road Palm Beach Garden, Florida. Alton is one of the newest homes that offer beautiful residential, commercial, offices and lots more for people of all stages of life. Alton feature over 300 homes of different variants with proximity to retail, offices, restaurant, opportunities for employment and everything Palm Beach Gardens has to offer. Search all homes for sale, just like an agent. Our free, one step registration allows you to bookmark your favorite houses, save search and receive emails as soon as new homes in Alton come on the market. The community of Alton offers over 300 homes that are elegantly designed and built with unique architectural styles. Alton features three types of home including the Townhomes, the Park Collection and the Edge collection. The Townhomes feature contemporary living with 3 bedrooms, at least 2 baths, and living space of over 2,600 square feet. These residences are nestled within the 3-story units that offer residents with luxurious and affordable single-family homes. The Park Collection also features spacious living ranging from 2,200 sq. feet to over 4,200 sq. feet with about six bedrooms configurations. These homes offer enough privacy as desired within the interior courtyards with rear-facing garage entranceways. The Edge collection in Alton offers the most luxurious and largest residences with spacious lots ranging from 2,100 sq. feet to 5,100 sq. feet. 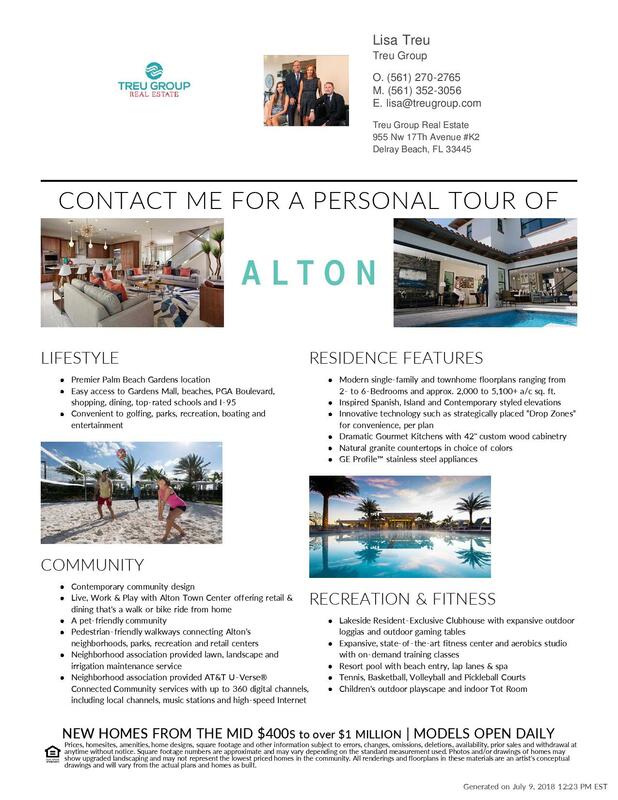 Alton is one of the newest communities in Palm Beach Gardens that feature impressive amenities including fitness centers, walking trails, basketball courts, billiards, clubhouse, community room, picnic area, swimming pool, street lights, sidewalks, spa-hot tub, and lots more. Alton homes are perfectly located close to high-end shopping venues within and outside the community including Publix Supermarket at the Abacoa, the Gardens Mall, and lots more as well as incredible restaurants such as the Coolinary Café, the Doghouse Grille, C.R. Chicks and more. Golf enthusiasts living within Alton are situated close to a number of golf communities such as Frenchman’s Creek Beach & Country Club, Old Palm Golf Club and more. Alton is also situated close to a great number of impressive Parks where family and friends can enjoy the afternoon together.